With world-class facilities and stadiums, Brisbane is also home to numerous popular spectator sports, such as soccer, Australian Rules Football, rugby and tennis. Formerly named the ANZ Stadium, the Queensland Sport and Athletics Centre (QSAC) resides on the southern side of the city centre, next to the suburbs of Macgregor and Nathan, where it can accommodate almost 50,000 spectators. In the past, the QSAC has played home to both the Australian Athletics Championships and the Commonwealth Games, as well as various rock and pop concerts. Other prominent sports stadiums in the city include the Brisbane Cricket Ground (The Gabba), which boasts an overall capacity topping 40,000. The Suncorp Stadium at Lang Park opened in 1914 and staged the prestigious Rugby League World Cup Final in 2008, being able to seat more than 52,000 people. Home ground of the Brisbane Strikers Football Club, the Perry Park Stadium lies within the suburb of Bowen Hills, being bounded by Edmondstone Road and Folkestone Street. The surrounding coastline features many superb beaches with frequent strong waves, especially during the winter months. This is without question one of the most important locations in Queensland for surfing. Close to the popular Sunshine Coast, the famous Surfers Paradise on the Gold Coast is the highlight for local surfers. 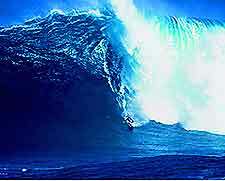 Each year, many surf festivals and championships are held here, often drawing large crowds of onlookers. 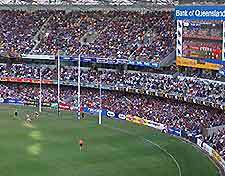 Australian Rules Football is run by the Australian Football League (AFL) and the city's main local team is the Brisbane Lions Football Club - the result of a merger with the Brisbane Bears and Melbourne's Fitzroy Lions. Regular games are played at the Gabba home ground in the Woolloongabba district. Rugby League is Queensland's premier winter sport and the Brisbane Broncos are one of the main rugby league teams in Australia. Regular National Rugby League (NRL) games are played at the Suncorp Stadium, which lies on the western side of the city centre, next to Boomerang Street and just down the road from the Castlemaine Perkins XXXX Brewery. Interstate Sheffield Shield cricket matches, international test matches and one-day cricket matches are held throughout the summer at the Brisbane Cricket Ground, known locally as 'The Gabba' and established in 1895. The local cricket season runs from October until March. The National Basketball League (NBL) in Australia is based on American pro basketball and this has become a popular spectator sport in the city. Basketball games are held at the Brisbane Entertainment Centre in Boondall, which is situated around 15 km / 9 miles from the city centre. The Brisbane Bullets serve as the principal NBL basketball team and have managed to gain a loyal following throughout Queensland. 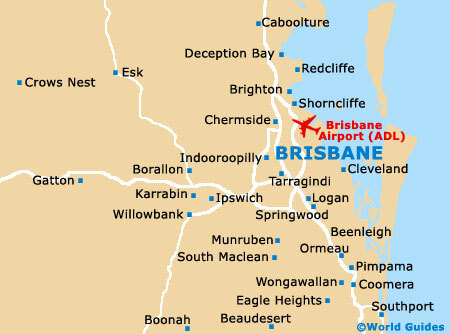 Horse racing is a popular local sport and the main venues are the Doomben Racecourse - home of the Brisbane Turf Club, and the adjacent Eagle Farm Racecourse, both of which are located in the northerly Ascot suburb. The Turf Club was founded in 1933 and hosts the famous BTC Cup, while Eagle Farm dates back a little further, being established in the latter part of the 19th century and known for staging the Queensland Derby, where prize money tops AU$500,000. There are numerous public tennis courts sited around Brisbane. However, if you prefer to watch rather than actually play yourself, then look out for the annual Brisbane International Tennis Tournament, which takes place each year in January and is held at the Queensland Tennis Centre in the suburb of Tennyson. Yachting is a major pastime in Brisbane and at the weekend, hundreds of yachts sail around Moreton Bay, many of which are quite imposing. There are several sailing schools based within the area, providing affordable introductory lessons. 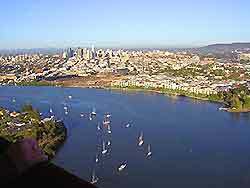 Sailing can be an extremely pleasant way to tour the Brisbane River and surrounding bays. Visitors, tourists and locals in Brisbane spend much of their time on the beaches, swimming in the South Pacific Ocean. Be sure to take note of the distinctive yellow-diamond signs warning against possible sharks, sticking to stretches with effective shark nets in place. Alternatively, head to one of the many outdoor swimming pools, which generally close at the beginning of May and then open again in October. Fishing is a particularly popular activity around Brisbane, with fishing charters and deep-sea trips around the Gold Coast and Surfers Paradise being extremely popular. 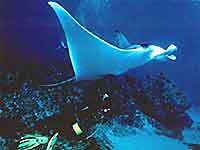 Fresh bait is always supplied, along with tackle and courtesy bus collections from nearby hotels. Those joining a fishing excursion can expect to catch some large jewfish, mackeral, marlin, pearl perch, snapper, teraglin, tuna and wahoo, as well as the occasional shark. There are numerous cycling trails throughout Brisbane that lend themselves to mountain bikes. Many of these trails are situated on the outskirts of the city and boast impressive views of the surrounding bushland and also Moreton Bay. Brisbane is home to some exciting extreme sports and outdoor activities, which include mountaineering, abseiling, caving, skydiving, jet skiing, bungee jumping, white water rafting, ballooning and speed racing.